Named for its fertile land and river meadows similar to that of Cornwall, England, Cornwall was originally a summer resort because of its river and mountain views, scenic trails, and fresh air. Today, it serves as a commuter town to New York City, and also serves as a health retreat away from New York City, offering plenty of hiking, rowing, swimming, fishing, hunting, and biking. Cornwall’s Main Street features several gift shops, restaurants, yoga studios, taverns, boutiques, and coffeehouses. Looking for a bite to eat? Try the Painter’s Restaurant or Hudson Street Café! 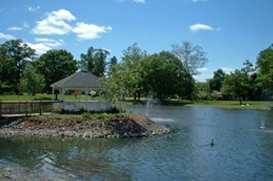 The Cornwall Recreation department offers several programs for both children and adults. There is also a local pool and wading pool. Children in Cornwall attend Willow Avenue Elementary School, Cornwall-on-Hudson Elementary School, or Cornwall Elementary School from kindergarten to fourth grade, and Cornwall Central Middle School from fifth grade to eighth grade. Students attend Cornwall Central High School from ninth to twelfth grade. Train service is provided by NJ Transit from the Salisbury Mills-Cornwall Station to the Hoboken Path Station, where you can transfer to the World Trade Center PATH Station in lower Manhattan.